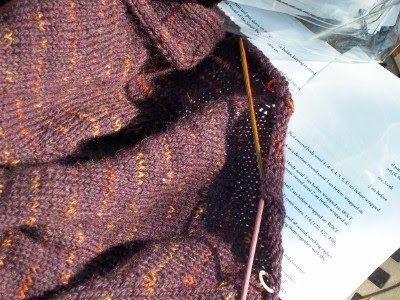 Second sock is turning into an explosion of orange and black confetti. This is what I hoped would happen. 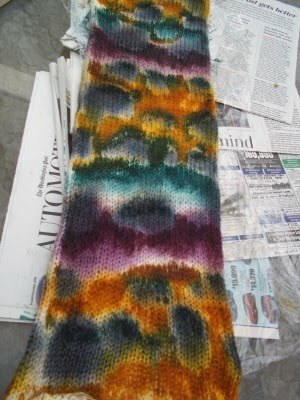 I didn't want the socks to have tiger stripes so I purposely didn't soak the blank before adding the dye. 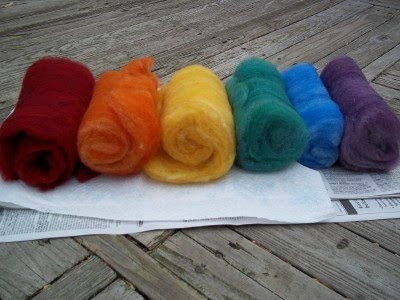 That kept the color from soaking through the blank and dyeing all the natural colored wool. 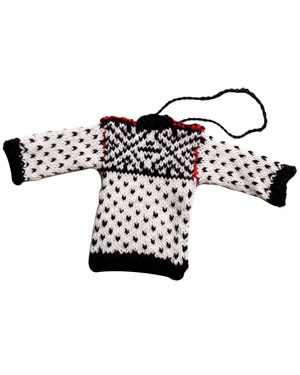 The inside is is pretty much dye free which makes spots on one side of each strand of wool. The verdict is out on whether I am going to like these when they are done but for now it is fun watching patterns emerge from the spots. 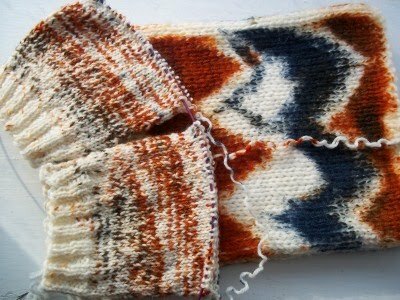 I couldn't decide which of the two blanks I recently dyed to knit first so I started them both at the same time. 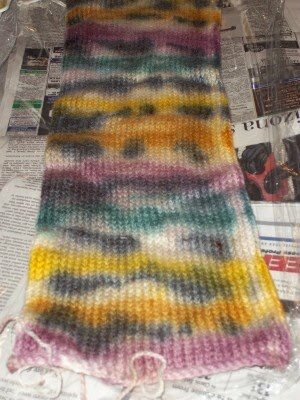 Sock blank number one is turning out pretty much as expected-lots of muddy color changes. I like the technique I used but not the colors. I should have stuck with colors that can bleed into each other without turning into gray. Tomorrow I'll show you what happened with number two. 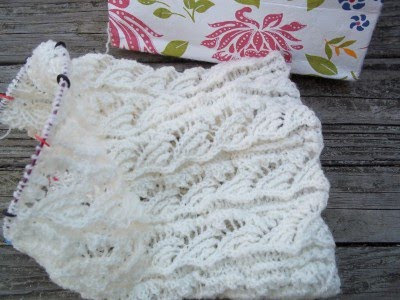 I cast on another of my favorite top down vintage baby sweaters for a former co worker who is due in March. She is having a little girl already named Shelby. If you are a fan of Steel Magnolias, I don't have to tell you how much fun it is to finally be able to make this sweater in Blush or is it Bashful? 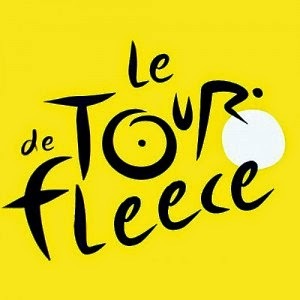 This is my official finish to the 2010 Tour de Fleece. 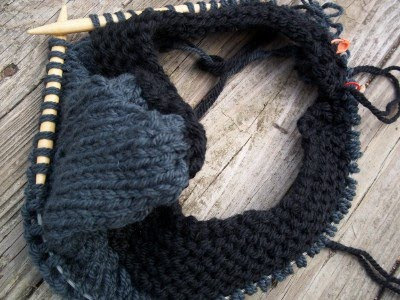 This is the Cormo cowl that I began spindling in July. This is what I intended to make when I began. I know I posted earlier about the project I did complete but it was just thrown together with scraps so I could say I had finished something with the wool I had slaved over in 100 degree heat. This year I may look into some of those performance enhancing drugs they keep talking about because apparently I just can't keep up anymore. Visiting dear old Daddio is like taking a trip to a tropical island in the middle of winter. He has so many projects going that his work room looks like a flower garden. It is not often that I really, really like something that I make so having this small success has made me want to make more and more and more of these hats. 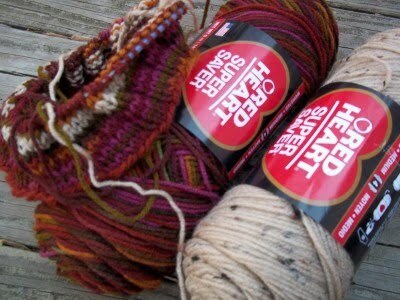 By reversing the colors I can get at least two out of the two cheapo skeins of Red Heart. Looking at all of the other multi and tweed combos they offer for $2 on sale, I figure this obsession can go on pretty much forever. Anyone want a hat? Imagine the sound of brakes squealing. 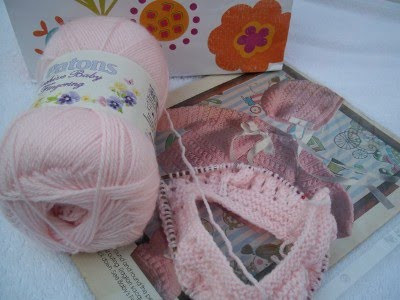 That is what my mind is doing right now as I work on the short rows for the neckline of my Classic Lines Cardigan. I am not having trouble with the wrapping and turning. 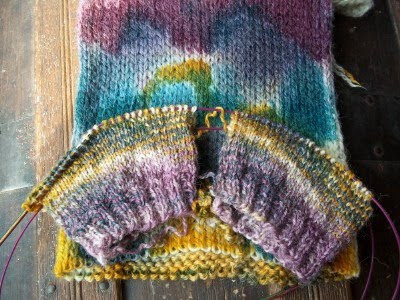 I am scratching my head over what to do with the strand of contrast color that you add in every six rows that is right now hanging way over in the steek zone. 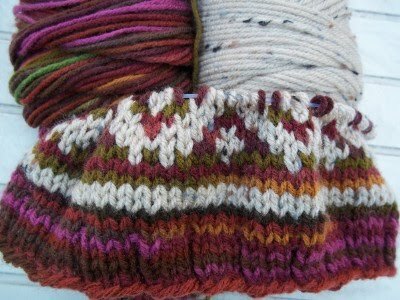 The pattern doesn't tell you what to do with it and I got a different answer from everyone over on the knit along. I guess it is one of those things where you have to decide for yourself what to do. I hate that. So how much do I like my new felted clogs? 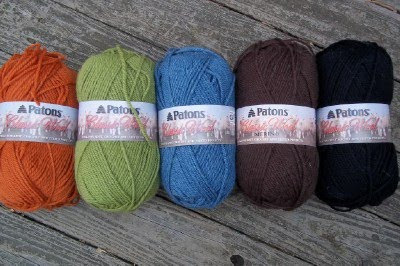 Enough to run out and buy more Patons Classic Wool in lots more colors. Good thing I found it on sale. I am kicking myself now for not buying some purple and red. I just saw some purple ones with red soles that are just to die for. The blanks have dried and they are not too terrible. 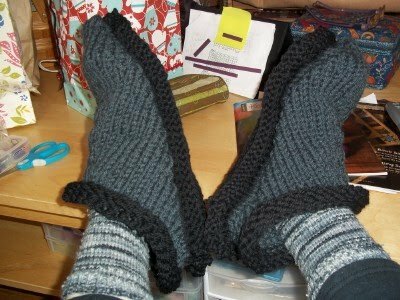 You can never tell though until you knit them so the next step is casting on. Now to decide which one goes first? Knit night was loads of fun but I realized very quickly I don't have the right types of projects going that for that kind of activity. I need something pretty mindless so I can talk and have a glass of wine. 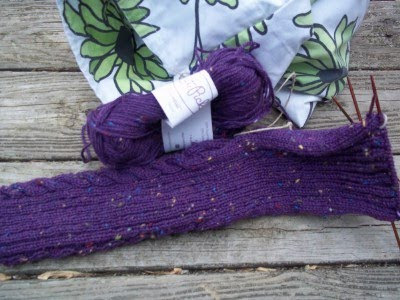 Sock blank knitting would be perfect and I already have a blank dyed and ready to go. The only problem is that it is ugly. Very ugly. 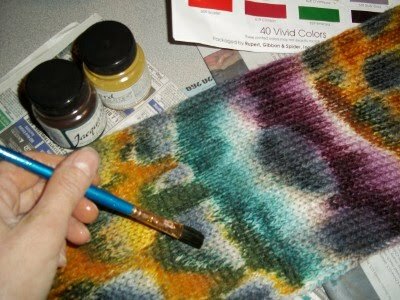 I got out the Jacquard and used it like watercolor to add another coat of the same colors. 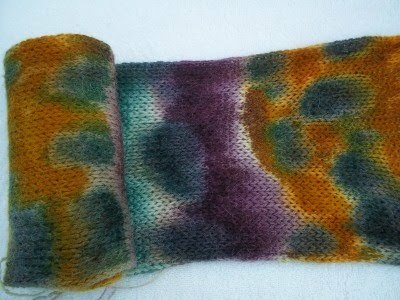 The sock blank is beautiful now but I know full well that steaming it is going to muddy and ruin the colors as they all run into each other. I didn't even soak it first and I let it dry a bit before wrapping it up but moisture plus gravity does strange things when dyeing. Since I had all the stuff out and another undyed blank I decided to make those Halloween socks I was thinking of but too sick to make this past fall. 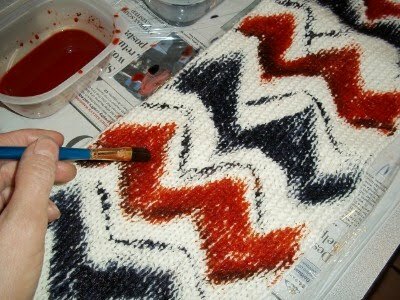 I want them to be tweedy and I hope by leaving all the white I will get just pops of color here and there. I know from experience that those zig zags will end up as stripes. EVERYTHING always ends up as stripes of one kind or another. My little Charlie Brown roll is ready to go into the steamer but as I said before all that steaming makes changes that sometimes is not nice. I've got my fingers crossed that one or the other will be suitable to take out in public. 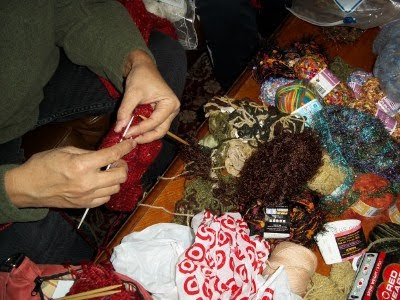 My former lunch bunch knitting friends decided to start an after school knitting group in a local cafe. Our first meeting was a riot. Yarn exploded in every direction. We attracted a bit of attention. 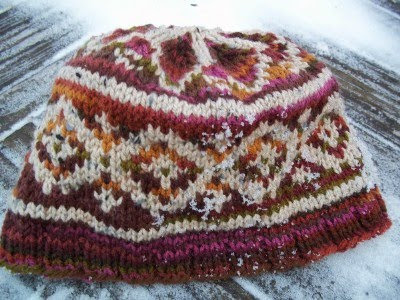 I'm not sure how much knitting got done but it was lots of fun. 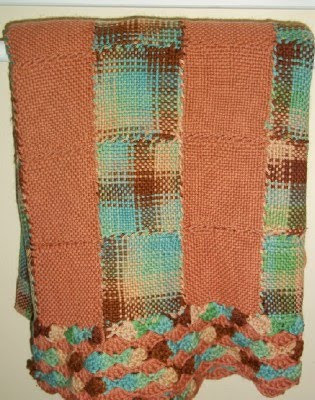 My great grandmother made piles of afghans for the family on her original wooden Weave It loom. Seeing the last remaining one at my sister's house brought back a flood of memories. 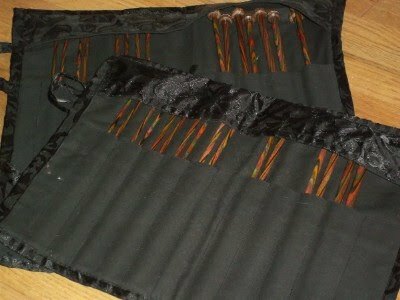 When I think of how I had that loom and let it somehow disappear in the chaos of life, I am ill. Who would know that that 40 years later they would become such a hot item again? 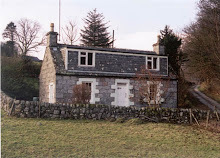 Imagine what I could have done with that little loom and all the handspun I have laying about. 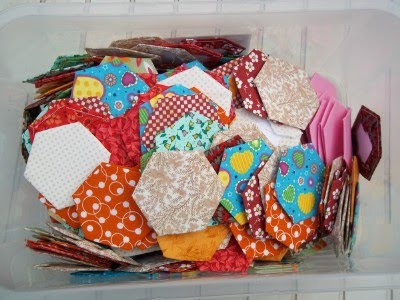 I am making good on my resolution to get old projects finished. 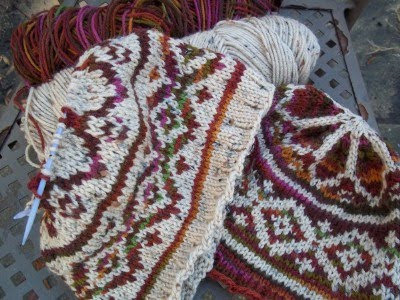 The Cormo cowl that I have been working on since early fall is getting close. I think. 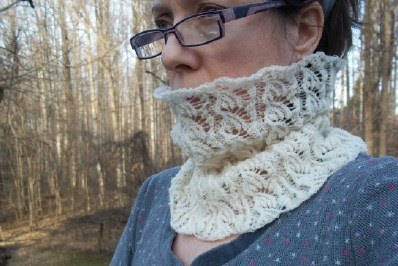 The pattern for the Flared Smoke Ring says to knit for 18 inches but that is a lot of cowl for a little neck. Every time I finish a 8 row repeat I say I am done but then I can't bring myself to bind off quite yet. 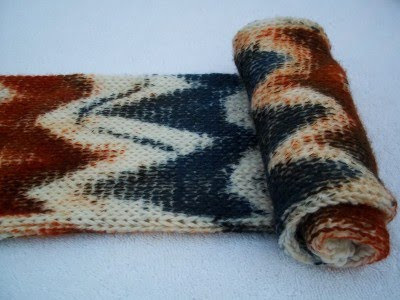 I guess I'll keep going until I run out of my handspun. That will make me stop for sure. I'm not washing anymore Cormo in the dead of winter. It's too dang cold to be fooling around with wet wool. 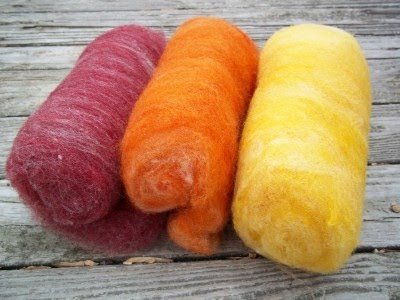 I dyed a rainbow of Clun Forest this summer and put the batts away for winter spinning. When I recently took them out I was disappointed with the one that was supposed to be red. It looked pink. I dumped it in a dyepot with some Fire Red Jacquard. Big mistake. When it dried it didn't look right with the others. 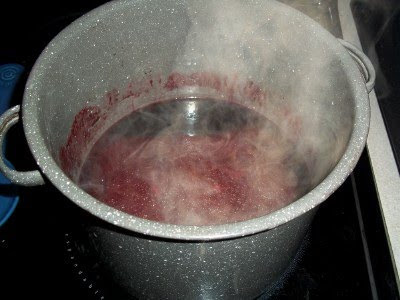 I had forgotten that I had not dyed them in a pot but had dipped the locks to get a graduation of color before carding. 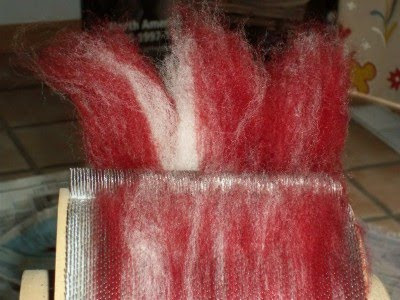 Luckily I had a white Clun Forest batt put away so I carded in some white with the red. 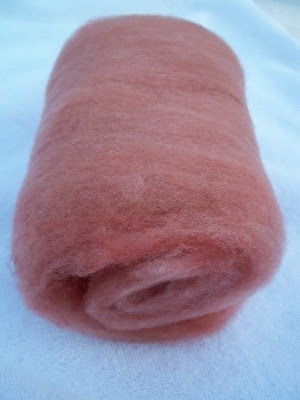 It took quite a few passes through the carder to get it to blend but it is getting closer to what I need. Whew, that was a close one. All's well that ends well this time but I hope it teaches me a lesson to stop and think before I dye. I love this hat. I really, really do. The colors are wonderful together and it actually fits. I have been looking for something smart a** to say about it but I can't find anything because I really, really, really love it. 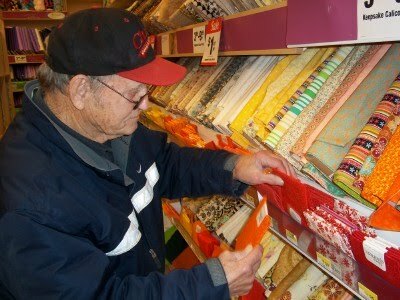 Dad has run out of quilt making materials so we took a day trip to the other side to the state to visit my sister who is lucky enough to live near the biggest Joanne's Fabric that I have ever seen. 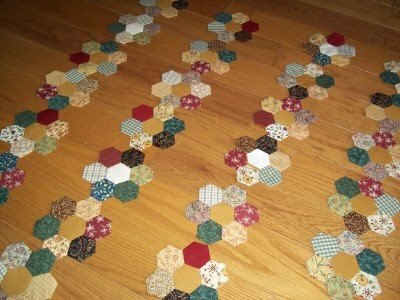 Sister and I were also trying to figure out how to use up all the remaining hexagons from Dad's very first quilting adventure. It looks like we have yet another Granny Garden in the making. I finally got both clogs done but as you can see the right "bumper" on the sole is larger than the other. I have no idea how that happened but I should have fixed it before felting. 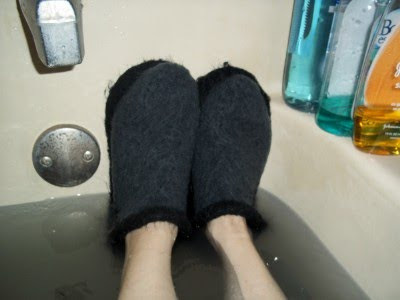 On a cold winter night I had fun sloshing in the tub agitating the clogs. It was a great workout. After about 45 minutes they started to really shape up. One of them made me very happy. The other one did not. Before stuffing them and leaving them to dry for a few days, I gave the one on the right an extra 15 minutes of sloshing hoping to get that big bumper shrunk down with no luck. My next pair will be bumperless. 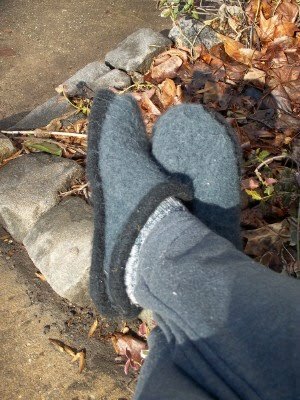 You can see in this photo how fuzzy the slippers became. That left a ton of wool in the tub. I use a bucket to bail the water out into the toilet in order to avoid clogs in the drain. Get it? 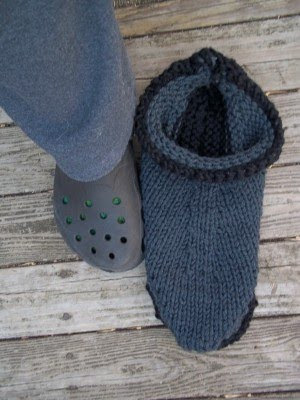 Clogs? In the drain? Sorry. 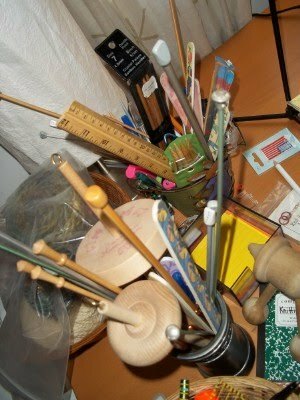 I have been knitting for 33 years and I have more needles than a methadone clinic but I never have just the right one I need. Ever. 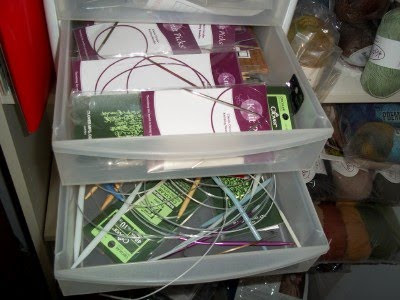 I'd like to figure out the mathematical equation for how many types of needles-length and diameter there actually are. 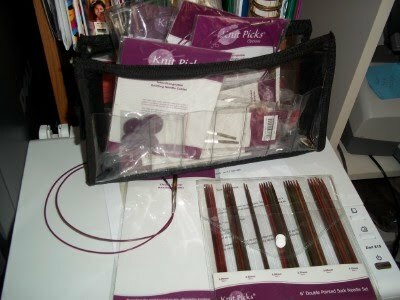 I own all of the Knit Picks needle kits but still have to order needles on a regular basis when starting a new project. 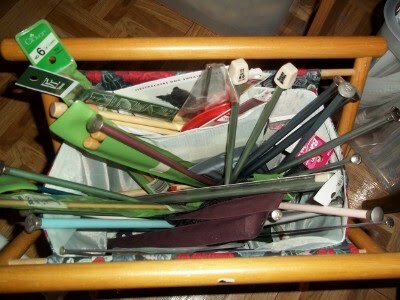 Interchangeable, straight, double pointed, circular, nickle, plastic or wood, I think that I should have them all by now. They are stuck in every nook and cranny of my house but I always need a pair that I don't already own. This is just crazy. If I only showed you this picture you might have a very different impression of this Fake Isle hat than if I included the next one. 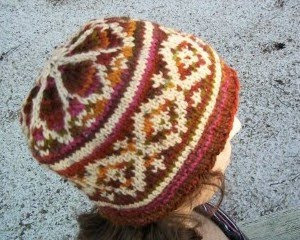 I am a big old yarn snob just like everybody else but when it comes to stuff on my sensitive head only acrylic will do. 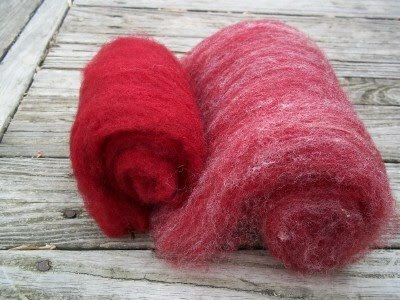 I love my wool but only below the neck. Those clogs I am making look pretty crazy before you felt them. They are HUGE. They are supposed to be that big, really. 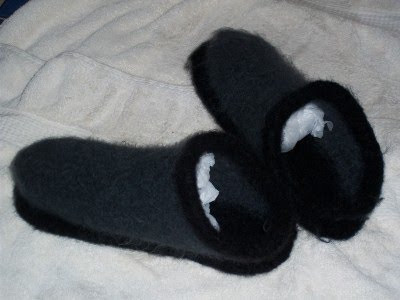 They will shrink and shrink and shrink until they get foot sized and while they shrink the knit fabric will disappear and a fuzzy solid one will appear like magic. I was really tempted to go ahead and felt this one before I finished the other one just to see what happens but good sense overtook desire and I will wait until I have the both of them done before the fun begins. If I am ever going to finish what I start I need to start writing down what I do so I can figure out how to finish projects I pack away. The new rule has to be that NOTHING gets packed away without complete directions on how to get started again. 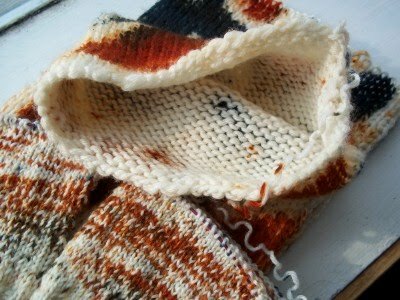 This sock needs a mate but I have no idea how many rows the cables are and how they twist. I am cable impaired-meaning I can't figure them out just by looking at them-so counting won't help. I guess it will be trial and error or should I say: try and rip. 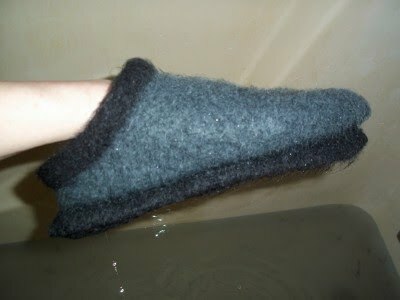 The felted clog pattern is a real head scratcher and then suddenly it all makes sense when you see a foot start to emerge. I had to do a lot of counting and placing markers to keep my sense of where I was in the pattern but it is certainly worthwhile when you see it all take shape as if by magic. It is a fascinating pattern. Lets hope I get some fascinating clogs out of all this work. 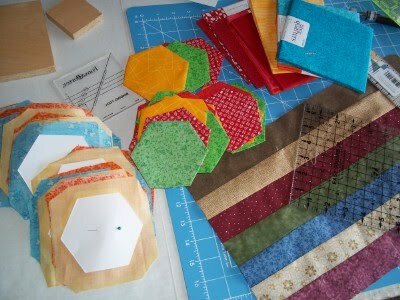 Old daddio has been very busy cutting and sewing another bucket full of hexagons. He needs to open an Etsy store and sell them as a kit. The man is a machine. Daughter's sweater, here posing rather awkwardly, is DONE. I give myself a grade of D+ due to major screw ups at every step of the frustrating design process. Everything was frogged and redone at least twice. I HATE the way I steeked and picked up the sleeves and don't even get me started on the way the front design panel is not completely centered. 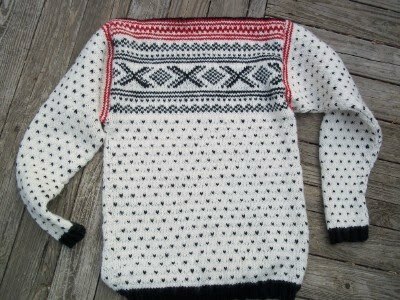 You couldn't pay me to design another knitted anything for anybody. I am not Mozart but I am Yo-Yo Ma, ready to take somebody else's pattern and create a work of art. 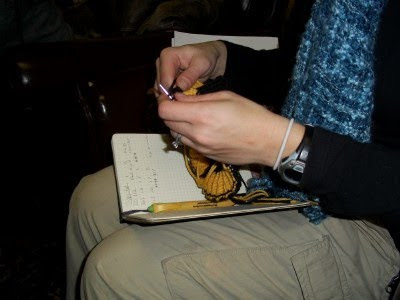 I'll do the knitting-you do the thinking. Thank you very much. 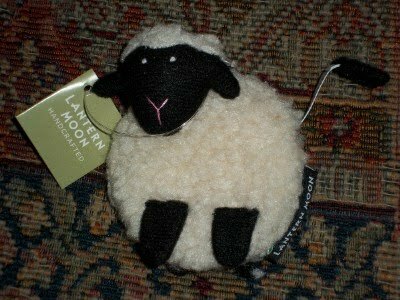 Future son in law ordered this cute little lamb measuring tape from Knit Picks intending it for my Christmas gift. Somehow UPS sent to the wrong place and it ended up lost in the mail. 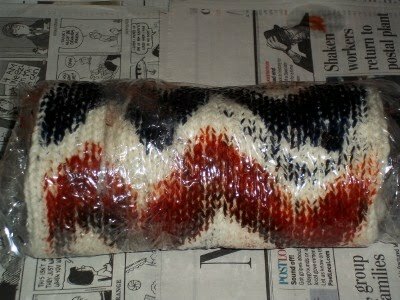 The good folks at Knit Picks customer service were very nice about it and sent me another that arrived today safe and sound. Isn't it cute? Now I've just got to convince the cats it is NOT a cat toy.